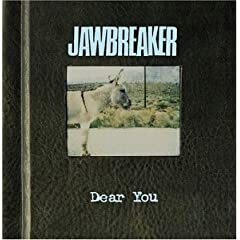 Jawbreaker are one of those bands who inhabit(ed) a rather predictable and (even when they were around) tired genre, and yet through the passion of the performances and the edgy, interesting nature of the compositions managed to exceed the achievements of the majority of their contemporaries. Indeed records like 1994's 24 Hour Revenge Therapy and the one I've got music from today, the following year's Dear You became, for better or worse, major influences on the more poppy denizens of the late 90s and early 00's emo(thats the old emo folks) / powerpop scene. It was in fact their fourth and final album, and their only major release to come out on DGC, a major they had moved to in the wake of the mid 90s Green Day inspired buying spree that mirrored the PR invasion of Seattle a few years before (an excellent article on this trend was featured five years or so ago in Punk Planet and is well worth seeking out for punk history nerds). They did this to try to expand their audience, and although the inevitable cries of sell-out (fuelled by support slots for Nirvana) bothered them, it was actually tension between band members and a feeling that they couldn't develop further that led to their split a year later. If you like the songs below, all of their catalogue follows similar paths and is worth seeking out. Enjoy! i love me some jawbreaker. 24 hour revenge therapy is probably the best. Classic album, perfect mix of somber music played heavy with energy.